Bonus Offer and Enrollment Ends Soon! LET'S GET YOUR CHILD THRIVING AGAIN! Will this course help my child? ...If you answered YES! to any of these questions... this course is for you and will help your child! You took your child to their pediatrician who put them on a steroid but it only worked for a few weeks. You tried a new diet but your child is picky and wouldn’t eat what you fed him or her. You took your child to a specialist but left feeling frustrated and stressed out about medical bills. You were told your child needs a medical procedure and you're hoping there's another way. You read all that you could about your child’s condition online but you still have questions. but the reality is you feel like you are failing as a parent. Relief from asthma and ear infections! You make small nutritional shifts every day. After a week or so, what seemed impossible begins to get easier. Before you know it, your child has gone an entire month without getting sick or being on medication. Now imagine after that, you find yourself completely content as you watch your child play outside. What would life be like if you could spend more time with your family instead of at the doctor's office? Picture the smile on your child's face when he or she is finally feeling better. Can you picture your child thriving now? I remember when I first started practicing medicine out of residency. At that point in time, my medical toolbox only included prescription medications, testing and referring the children to specialists if the meds weren’t working. Both the parents and I were confused, overwhelmed and somewhat defeated. I wanted these kids to feel better just as much as the parents in my practice did. I simply didn’t know there were any alternatives to what I had been taught in medical school. I didn’t know then what I know now. Now I am blown away by how easy it really CAN be to significantly improve or resolve altogether some of these common childhood illnesses like reflux, eczema, bumps on the back of the arms cheeks and thighs, recurrent ear and sinus infections, chronic runny nose, nasal congestion, mouth breathing, snoring, allergies, asthma, constipation and abdominal pain. I finally figured out the missing piece of the puzzle when it comes to helping children with chronic illnesses get better. Next, I spent 8 years helping kids with chronic health issues heal and start thriving again. I was seeing hundreds of kids get better and hundreds of parents happy again because they got their child’s health back. I knew I couldn’t keep it to myself! So I put together the powerful tools I created into a step-by-step program for YOU. I felt like I was on a treadmill every day. I was running from room to room prescribing antibiotics, anti-histamines, laxatives and steroids of all types. The same families were back in the office every month once the medications wore off. I knew there had to be a better way, but I wasn't quite sure how. So when a patient's eczema cleared up after making nutritional changes, I set out to learn more. And, I finally found the missing piece of the puzzle. I completed a two-year integrative medicine fellowship with Dr. Andrew Weil through the University of Arizona where I studied nutrition and holistic medicine. I learned how to use my conventional training along with nutrition and it's made a huge difference! “We began our journey with my 4-year-old's battle with chronic constipation about 2 years ago. We had tried a lot of the over the counter medications to help. The medications did help to immediately relieve that situation at times, but overall, we knew that we were looking for the why behind what was going on and some more natural remedies as well as additional education for our family to help make some different lifestyle choices. I also have an almost 2-year-old son who was born with a rare heart defect and had heart surgery when he was just 6 days old. We knew with all of the treatments and surgery (multiple rounds of antibiotics, etc.) that it was important o help heal his gut and ensure that he had the most healthy and robust immune system as possible. We are incredibly fortunate to have been a part of this course. My entire family has been positively impacted by it!" This is a mom who took the course. WHAT'S THE MISSING PIECE OF THE PUZZLE? It can be! I developed a process that I call the 7 STEPS TO HEALTHY KIDS HAPPY MOMS™. It's a simple 7 step process that helps you get your child thriving again and sets him or her up for long lasting health! In this course, I give you the same information that patients in my private practice receive, so all you have to do is follow the steps. You won't spend countless hours every day searching for answers. You won't waste time and money trying things that don't work or are only a temporary fix. You won't search endlessly online because the course has everything you need. I've done the research and laid the groundwork for you. All you have to do is put in your own hard work and the course and step-by-step system will take care of the rest! You can do this! "When we first came in my son had been hospitalized 3 times for asthma. Anytime he got a cold it seemed to turn into an ear infection, which triggered wheezing, and it would blow out of proportion from there. We followed the integrative approach and the difference has been amazing! He's gotten a few colds but they didn't turn into an ear infection so he hasn't had to take antibiotics or oral steroids for many months now! My husband has also benefited. He struggled with migraines, acid reflux, and heart burn. Now, almost all of his symptoms have decreased and he's off of his antacid." A winter without oral steroids for asthma! “My son's entire first year of life he battled chronic ear infections, chronic runny nose, coughing, asthma, terrible eczema, behavioral issues, and tantrums. He had ear tubes and was on prescription medications to treat his symptoms. After following Dr. Kilbane's recommendations for just 2 months, all of his issues improved, and he is a different child! We have seen drastic behavior improvement. His skin is 80-90% clear. And, we are finally able to go out in public since his tantrums have improved so much. I would tell other parents considering treatment options to trust your gut. There are ways to heal your child through food and supplements." Behavior issues and eczema... 80% IMPROVED! 32 kid-friendly recipes to help even the busiest of families make significant changes! "I want to take a minute to give some praises to my baby boy! I've recently learned that he has met all of his goals in OT and the school district is releasing him from special services at the end of this year because he has met all of his IEP goals for this year in pre-k! He still struggles with anxiety and opposition (and I can still see those dark circles looming) but he has come a long way! We also managed to survive the winter without a preventative inhaled steroid for his asthma and he's been off of reflux meds since the fall as well!!" "We've been doing this course as a family and I've been able to notice some improvement in my middle son's bumps on the back of his arms and his legs. They are drastically reduced! He still has a few bumps there, but they aren't as pronounced, and his skin isn't as red. Y'all, he has had these bumps since he was a baby! And he's 8 1/2 now! (and I have to admit that we've been on and off plan in the past few months with lots of travels. When we traveled for 2 weeks, about 3 weeks ago, his arms got really red again. We've been back at it strong for a 1 1/2 weeks again and he could see the improvement!" "Today I had to pour 1.5 gallons of milk down the drain because it was past the date and smelled sour... I replaced the usual milk at supper with a pitcher of water about a week ago. It seems like the two boys who are always making odd sounds to try to scratch the inside of their throats are now doing very little or none of that." This is an additional Login Support Pass for a loved one, grandparent, aunt, uncle, babysitter or friend who also feeds your child and who can learn along with you so he or she can help support your efforts! You'll meet other moms who can partner with you on your journey to better health. Get support from me and my team. I will be in the group answering questions, giving support and being your biggest cheerleader! Access to private Facebook live sessions where I will talk about different chronic illnesses and ways to help. You get access instantly to the entire program of 7 STEPS TO HEALTHY KIDS HAPPY MOMS™ and the Private Facebook Community. You will start receiving feedback immediately from my team and I on questions you post in the group. MY SON IS A PICKY EATER AND I AM WORRIED ABOUT CHANGING HIS DIET. ARE THERE OPTIONS FOR KIDS WHO ARE PICKY EATERS? I get asked this question all the time, especially in my private practice. The process we use to wean kids off certain foods and onto other more healthy foods is gentle, slow and doable for just about everyone. We have to first be sure to find other foods he will eat before we even begin to wean the inflammatory foods. We aim to broaden his palate and only when he starts eating more, do we begin weaning him off the other foods. In the meantime, we can use supplements to start healing his gut and getting his system back into balance. I HAVE ALREADY TRIED SEVERAL DIFFERENT DIETS AND SUPPLEMENTS WITH MY DAUGHTER AND SHE IS STILL SICK. HOW CAN I KNOW IF THIS PROGRAM WILL WORK? I find that the order and process we use in this program is the key. Many moms have tried many different things over the years, but often did not do things consistently and the interventions were done at different times. For example, you may have tried probiotics from the pharmacy for a month and then at a later time you tried eliminating certain foods for a week or two. However, there seems to be a few pieces missing. It might be that the child’s gut is still not healed and the way this program is designed, we start from square one and do things in a systematic fashion to optimize gut healing while decreasing systemic inflammation. CAN I GET THIS INFORMATION FROM MY CHILD'S PEDIATRICIAN? When I went to medical school in 1998, I was not given any nutritional training whatsoever. It was simply not part of the curriculum. It is likely that this is also the case for the doctor your child is seeing. I have spent the better part of the last 10 years educating myself and getting formal training in integrative medicine so I could understand how to utilize nutrition to help the children like yours. I AM REALLY BUSY; WILL I HAVE TIME FOR THIS PROGRAM? When you sign up for 7 STEPS TO HEALTHY KIDS HAPPY MOMS™, you receive access to the entire program: all the videos, handouts and recipes at once. You can complete each module at your own pace and you have lifetime access. So even if this is a particularly busy time for your family, you can make the investment now and begin going through the modules at your convenience. 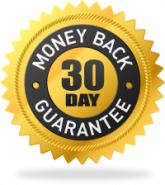 I genuinely want your child and family to enjoy great health, which is why I offer a 30-day money back guarantee. Simply let me know within 30 days if you would like a refund, and I’ll give you one. At the end of the day, my aim is to make this course attainable and enjoyable for any parent wanting to learn how nutrition impacts their child's health. I wholeheartedly believe that 7-STEPS TO HEALTHY KIDS HAPPY MOMS™ will help you achieve your health goals for your child faster and more effectively than if you continued to search for these answers on your own! Someone not willing to work through a challenge: Lasting changes take work. It can be hard and frustrating at times. Just like everything else in life, what you put into is what you get out of it. Someone not willing to do a little bit of trial and error: Let’s face it. Whenever you learn anything new, you're going to have to figure out what works best for you and that will mean being flexible!